Looking For Driver Friendly™ DOT Physical Doctors in Delaware? Choose from a select group of family practice doctors who truly understand professional drivers and the importance of having a valid CDL medical card. Be prepared for the dot medical exam before you get to your appointment, so you can get in and out on time, and get your dot medical card right, first time. then found out that the new medical card was invalid… and the whole caboodle just invalidated his CDL? Medical card invalid – Doctor not on the National Registry of Medical Examiners. Medical card invalid – The examiner uses wrong forms or makes mistakes on the medical card. Disqualified or short-term conditional medical card – The examiner applies regulations and guidelines inappropriately. $ Costs mount up – High exam fee, hidden fees, add-on tests. Waste your time – Not able to make an appointment. Keeps you waiting in line. All our doctors are DOT Certified and validated on FMCSA National Registry of Certified Medical Examiners. The examiner makes sure your documentation is correct and that you have a valid medical card. The examiner will guide you reasonably and fairly through all the requirements to qualify you for a DOT medical card. The dot physical cost is all inclusive and fair. Appointments are made for the driver’s convenience – We see you on time, and save you time. Get In & Out ON TIME! Get Your Medical Card DONE RIGHT THE FIRST TIME! Indicates parking available for tractor-trailer, delivery vehicles, and buses. Check parking options on DOT Doctor’s webpage. Large CMV parking usually available nearby. 1. The Doctor’s Offices are listed in order of ZIP code. Click the + sign (on the map below) to zoom in on the map and separate the pins. Drag the map with your mouse to see your area of interest. Click the box (on the map below) to see the map fullscreen. Be Prepared BEFORE You Go To Your DOT Physical Appointment! Be prepared for your DOT Medical Exam. Understand the DOT physical requirements. Take everything you need to your appointment. That way you’ll help the medical examiner qualify you for all the Medical Certification requirements. You’ll be in and out on time, and back on the road with a valid medical card. 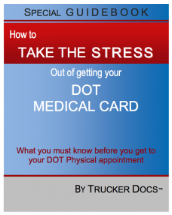 “How to TAKE THE STRESS out of getting your DOT MEDICAL CARD. What you must know before you get to your DOT Physical appointment”. Get your questions answered about personal health conditions, medications, required tests and primary doctor’s medical opinion letter. Read questions from other drivers on our FAQ forum. Get the checklist of things you need for your DOT physical appointment. Commercial drivers, who are required to have a CDL medical card, are personally responsible to provide a copy of the new Medical Certificate to the licensing agency of the state in which their CDL was issued. Contact your State driver licensing agency for information about how to submit a copy of your medical certificate. For more information on the States’ self certification affidavit, and State CDL and DOT Medical Card Requirements – read this blog article. This link will take you to Delaware CDL and DOT Medical Card Requirements. If you have a Delaware CDL, your Driver Friendly™ DOTPhysicalDOCTOR may even be able to save you time by faxing your updated medical card information to Delaware DPS. The information provided on this website should not serve as a substitute for professional medical care. Please see a qualified medical provider if you have any concerns about your state of health. Copyright ©2010-2019 Emiton LLC All Rights Reserved.